Sixteen areas recorded ‘very poor’ air quality and 22 areas in Delhi recorded ‘poor’ air quality, according to data by the Central Pollution Control Board. NEW DELHI: Delhi has failed spectacularly in preventing the air quality from falling into the “severe-plus emergency” category the morning after Diwali. 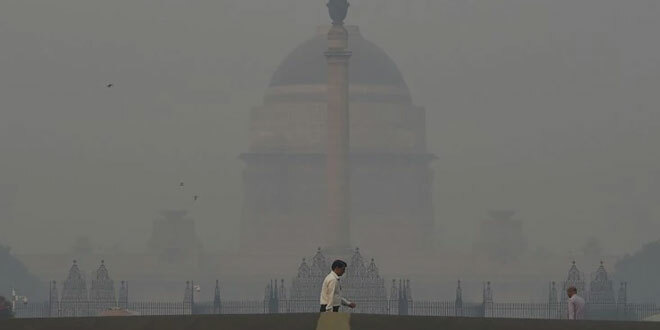 The national capital recorded its worst air quality of the year today with the overall index rising to 574, which falls in the “severe-plus emergency” category, according to data by the centre-run SAFAR. The overall air quality index or AQI was 10 times the safe limit — AQI above 500 falls in the “severe-plus emergency” category, according to the government-run System of Air Quality and Weather Forecasting And Research. Anand Vihar was among the areas in Delhi where the AQI was recorded at an alarming 999 this morning. The AQI around Major Dhyan Chand National Stadium touched 999 (the maximum level for the monitors) while the US embassy in Chanakyapuri scored 459, all under the “hazardous” category. Delhi police and leadership have failed the court-order which was not followed by a spirited action to save the city and its residents. The policing is a farce everywhere and they only act under pressure. The ‘will’ to deliver what they are mandated to is lacking and the leadership is more interested in sloganeering and vote bank than performance. The statement by the national president of ruling party and one of its Delhi MLA is shameful in contempt of the highest court. Ever wonder what theirs next generations will inherit, and what they wish to deliver to the people who vote them to power.